Tutoring jobs online are a great way to use your academic skills and make a difference for students. Here's an interesting press release on job satisfaction. Tutor.com released today the results from the company’s annual survey sent to the 2,000+ tutors who provide more than one million live, one-to-one online tutoring and homework help sessions each school year to American students. Approximately 77% of tutors participated and more than 95% report they are satisfied or very satisfied with their tutoring jobs online at Tutor.com. Tutor.com’s commitment to high quality learning was the catalyst to create a one-of-a-kind mentoring program for its network of workers doing tutoring jobs online. At Tutor.com, every tutor is assigned a Tutor Mentor who reviews their sessions and offers constructive feedback to enhance their learning engagements with students. Tutor Mentors are highly experienced online tutors who themselves have the opportunity to become Senior Tutor Mentors and part-time employees with Tutor.com. This layered approach to professional growth for tutors has created a 95% recommend rate from students and a 95% job satisfaction rate among tutors. Tutoring jobs online are an ideal position for men and women who require flexibility and a remote work environment. Tutors can work from anywhere and choose their own hours. Approximately 10% of the tutors are affiliated with the military in some way, most often as a spouse or retiree. Military families move often and Tutor.com allows a spouse stationed in San Antonio, Texas to keep tutoring when she is re-located to Ramstein, Germany. Flexibility is also key for teachers and professionals on leave to care for young children, or current teachers who tutor in the evening hours. “Tutor.com is much more organized and better suited to the online environment than any other company. The classroom is awesome and is the best I've used. The company organization is superb and works to fully 'train' tutors in their subject in the best way possible--by letting them work and get the experience they need. The emphasis on student security and the focus on education rather than sales makes Tutor.com by far the best of the best,” responded a tutor in the survey. Tutor.com is currently recruiting physics tutors, chemistry tutors, calculus tutors and statistics tutors for the 2011-2012 school year. Visit http://www.tutor.com/apply for additional information. 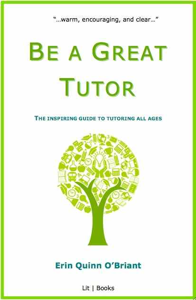 Be a Great Tutor: The Inspiring Guide to Tutoring All Ages is a great way to get started with your new job Your purchase includes a free one-year profile on this website! Only $15.95...why wait? Find oodles of tips and tricks for tutors on this site. Return from Tutoring Jobs Online to Tutoring Jobs.